Graduation photo. 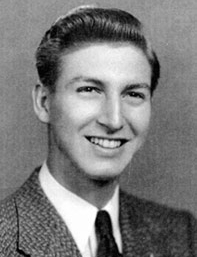 William was president of his high school class in 1941. 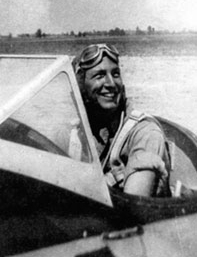 Aviation cadet Harker during primary flight training. 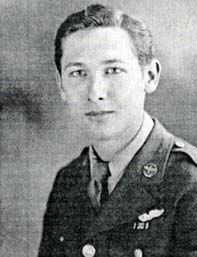 2nd Lt. William F. Harker. 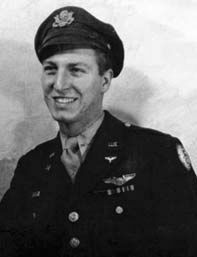 Robert D. Davis after thirteen combat mission with the Eighth Air Force, 392nd Bomb Group, 578th Bomb Sqdn. 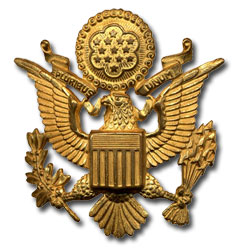 Like hundreds of young American high school graduates in 1942 there was little question as to where my future lay. I immediately tried to qualify for the Army Air Corps aviation cadet program. I passed the written exam but a few months later during the physical the color test did me in. The flight surgeon suggested that if I really wanted to fly, I could enlist and try to be a crew member as a gunner. So in November 1942, I did that along with two other friends, hoping we would remain together. We rode the train to Cincinnati for our physicals where friend number one was rejected because of a hernia. Friend number two and I were shipped across the river to Ft. Thomas, Kentucky, the reception center, where he was promptly re-shipped to St. Louis. 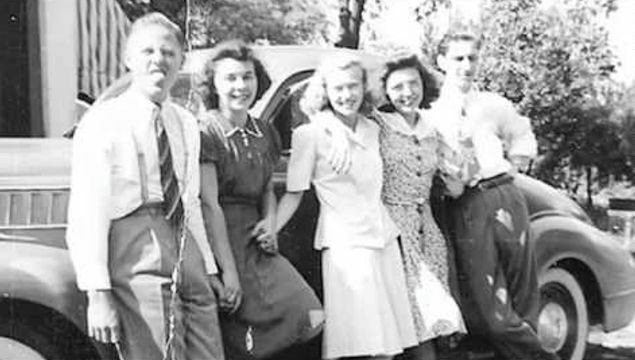 Bill (far right) with some of his High School friends sometime before his enlistment. My first time away from home, and by now with both my friends gone, I was really feeling quite alone when the fellow on the next cot introduced himself. Said his name was Bill Harker and that he was from Newport, Kentucky, a small town close by. I was so happy to have someone to talk to, I would have talked to a goat by that point it immediately seemed as if we had already known each other for a long while. Anyhow, he invited me to come home with him and meet his family and in no time I was feeling a whole lot better. They simply made me feel welcome. His Dad took us down to the VFW and introduced me around; they already knew Bill in very short order I not only felt Bill was my buddy, but that he was also my brother. Bill and I went thru basic training in Miami Beach and then on to radio school in Chicago. We shared quarters, classes, meals and whatever time off for recreational activities, mostly dancing at the Servicemen's Center. They usually had a good band and lots of girls. We saw two of them quite often, Mickey and Billy Hahn. Beautiful sisters, one brunette and one reddish blonde and they could dance. They would even show up on Sunday afternoon when a very small band played waltzes, that's all, waltzes. There were few takers so the floor was usually wide open. My Dad would have felt vindicated for he thought proper dancing ended with the waltz. Bill Adams, Jean, Bill and Robert, dinner at the Sherman Hotel. On Saturday afternoons cars with families would be lined up for a block from the hotel entrance. They would pick up the fellows that wanted to go and take them home for dinner and often kept them over and brought them back the next day. Bill and I got some free tickets and saw Buddy Ebsen in The Pajama Game. Bill's sister Jean came to visit her fiancé, who was stationed at the Navy Pier, and we shared dinner with them one evening. In the following spring Bill said he thought he would like to try for the Aviation Cadet program and since he knew I had already passed the written test would I tutor him for the exam and, of course, I agreed. Bill soon took the exam, passed and quickly left for pilot training.